The term 'Lied' is generally associated with songs for voice and piano by German composers of the 19th century, like Franz Schubert and Robert Schumann. But they didn't invent the 'Lied'; they were part of a tradition that goes back to the middle of the 18th century. Even the composers of those days didn't invent the solo song - the first songs for solo voice on German texts date from the early 17th century - Johann Nauwach published his 'Teutsche Villanellen' in 1627. At the end of the 17th century the solo song disappeared, mainly due to the growing popularity of the Italian chamber cantata. In the 1730s attempts were made to bring the genre to life again, but to no avail given the quality of works produced during those years. The first important collection of solo songs was Telemann's 'Oden' of 1741. It was the new aesthetic of the Enlightenment that music should be 'simple' and 'natural'. These criteria proved an ideal breeding ground for the solo song. It is no surprise, then, that composers and poets who represented the German Enlightenment made attempts to recreate this genre. Among them were poets such as Gleim, Kleist, Lessing and Schlegel, and amongst composers, Agricola, the Graun brothers, Quantz, Franz Benda and Carl Philipp Emanuel Bach. There were lively and extensive talks between these poets and composers. One of the subjects was the relationship between text and music. There was general agreement that the text was the main part of a song and that the music was a way of interpreting the text. 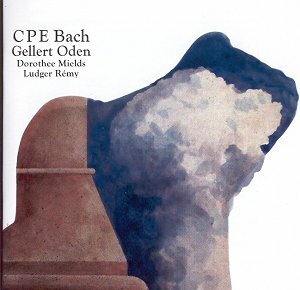 In the preface to his collection of the 'Sacred Odes and Songs' on texts of Christian Fürchtegott Gellert, Bach expresses this ideal thus: "One knows that didactic odes are not as convenient for music as songs for the heart; however, when the former are as beautiful as Mr. Gellert writes them, then one finds that one has a pleasant occupation in contributing all that is possible in order that the intention with which they were written be facilitated and consequently the benefits to be obtained from them be rendered more general." Gellert (1715-1769), the son of a pastor in Saxony, went to Leipzig in 1734 to study theology, but it was literature that captured his attention. In 1744 he wrote a dissertation about the history of the fable. In 1751 Leipzig University appointed him Associate Professor of Poetry, Rhetoric and Morals and he became one of Germany's most influential poets for about twenty years. His lectures attracted large audiences, among them Johann Wolfgang von Goethe, who wrote: "The admiration and affection enjoyed by Gellert from all young people was extraordinary". His collection 'Geistliche Lieder und Oden', published in 1757, enjoyed wide circulation. Some of his songs made their entrance in hymnals in Germany, like 'Jesus lebt, mit ihm auch ich' (Osterlied). When Bach set his texts to music, Gellert was startled at first, as he thought Bach's settings were too sophisticated for the texts, which he had written for a wide audience. "They are beautiful, but too beautiful for a singer who is not musical". Bach very much liked Gellert's texts. He re-used some of them in cantatas - for example the 'Weihnachtslied' Auf, schicke dich recht feierlich�. Others were arranged for a vocal ensemble. These included 'Bitten' - Gott, deine Güte reicht so weit. Unlike the solo songs written in the 17th century and the first half of the 18th century, which were for voice with basso continuo, Bach and other composers provided their songs with a part for keyboard. In his preface he says of the performance: "I have added the necessary harmony and ornaments to my melodies. In this way I have not wanted to leave them up to the arbitrariness of a stiff basso continuo player, and one can thus at the same time use them as hand pieces." With 'hand pieces' (Handstücke) Bach means that the songs can be performed as pieces for keyboard solo. He adds that this way these songs can also be played when the vocal parts are too difficult to sing. This demonstrates that these songs were composed for both 'Kenner' (professional musicians) and 'Liebhaber' (amateurs). As these settings are all strophic, the connection between text and music couldn't be too strong. In line with this the keyboard part is mostly about creating an atmosphere, for example in the introduction and the epilogue. It is not too far-fetched to see a parallel with Schubert's songs here. In Dorothee Mields and Ludger Rémy these songs have found their ideal interpreters. The very delicate voice of Dorothee Mields is excellently suited. Her diction is immaculate - even without looking at the lyrics in the booklet one can understand every word. All nuances in the text are clearly exposed, and Ms Mields always finds the right way to put the message across. She also takes some liberties when the text requires special accents; her ornamentation is always appropriate. Ludger Rémy very effectively uses the fortepiano to enhance the atmosphere of every song and to support the voice. He has previously recorded Bach's songs with the bass Klaus Mertens (CPO 999 549-2 and 999 708-2). Here again he proves to be a most sensitive interpreter. These songs show a side of Carl Philipp Emanuel Bach which in general receives little attention. There are no strong dramatic contrasts here, but a rather introverted expression of personal faith, as Bach indicates in his preface: "I have in particular made these songs more generally useful to lovers of music and have wanted in this way to give them occasion to edify themselves." I strongly recommend anyone to use that occasion.